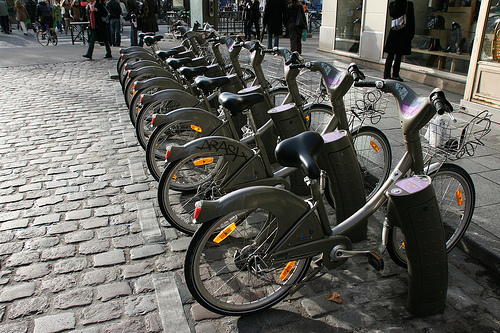 Bike docking stations in Paris. Photo by dangiles73. Last week, Ken Livingston, the Mayor of London, announced an ambitious plan to transform the British capital into a pedestrian and cycling city, an effort that he expects will reduce London’s carbon footprint by approximately 1.6 million tones. Following the lead of Paris, his plan calls for an extensive network of bike docking stations located every 300 meters throughout the city, allowing Londoners to quickly pick up a bicycle, ride it to their destination and leave it at the nearest docking station for someone else to ride. The city will also create road infrastructure for cyclists, building 12 “radial cycling corridors” on existing roadways to protect cyclists from traffic. Over the next decade the government expects to spend 500 million pounds on the system. The effort to move people out of their cars and onto their bikes dovetails nicely with London’s congestion pricing scheme, which charges drivers a fee for entering central London. Click here to learn more about pedestrianization in London.